Ramlingeshwar Temple complex at Avani has several shrines and one of them is Lakshmanalingeshwara Temple. This temple is built by rulers of Nolamba dynasty in 10th Century A.D. This shrine is most ornate in the complex. The temple on plan has garbhgriha, an antarala and navaranga. The linga in the garbhgriha is largest in the complex. The navaranga has four pillars with relief sculptures and the ceiling has Uma-Maheshwara surrounded by dikpalakas. The external wall is ornate with friezes of elephants, lions, yalis and makara heads. Thank you for bringing this intricate work to us...really appreciate how they used to carve it! India must be filled with fascination from one end to the other. Other than for a stop in Kalkata on the way to Bhutan I have never visited. It is quite amazing that the complex has survived through the centuries. Impressive. Thanks for sharing. Love those two posing for you - they look like fun traveling companions! Great shots again! The interior is very ornate and lovely! A magnificent place and beautiful, happy children!! Doesn't get any better, Rajesh!! I hope you have a great new week!! What an amazing temple - your kids look like they're enjoying being there. Beautiful images. The architecture is stunning. Wow! Interesting pictures and unfamiliar words make this so exotic to me. Love the elephants! 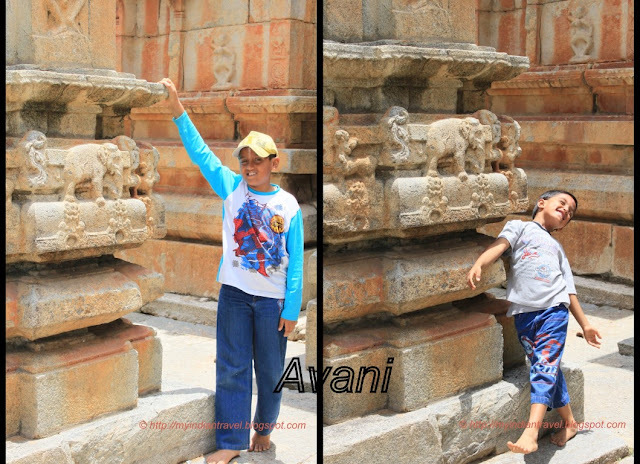 Lovely shots of the temple and your children! Have a happy week! It is remarkable how much work went into the construction and sculpting in this temple. Truly beautiful place. Another amazing temple but adding the boys to the photo really creates the personal touch. The red slams on the lady really pop against the stonework. Nice shots. Handsome little men and gorgeous temple shots! As always, so beautiful and ornate. I can't get over all the amazing and ornate temples you have posted over the years. You are really lucky to live around such beautiful buildings. Very nice place and captured fantastically.